The end of November saw a remarkable occurrence. 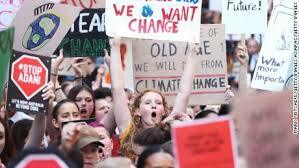 In a week of raging bushfires in Queensland and rain-induced chaos in Sydney, some 15,000 students walked out of school and rallied in 30 cities and towns across Australia for the School Strike for Climate Action, calling for an end to the delays from government on effective climate change policies. Amongst the debates about whether it is appropriate for children to strike, the merits of a hands-on education in civics, and what drives social and political change, there are other pressing questions. How long can stereotypes of climate change activists persist, with an increasingly diverse movement? Is it acceptable for parliamentarians to refuse to meet with our children? And when so many feel the need to walk out of school, is it not finally time to respond with real action to protect their futures?